Cyprus is a wonderful island of contrasts.Where else could you ski in the morning and then be sunning yourself by the pool or on the beach in the afternoon? 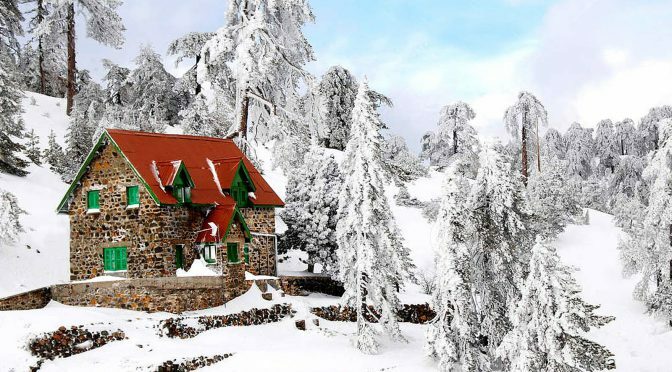 Those who enjoy all sorts of sports from water sports to skiing will be satisfied when visiting Cyprus.The mountains of Troodos are, without a doubt, a popular summer destination as they offer coolness from the sizzling temperatures. However, believe it or not, they also reach a peak of visitors between January and March, since they are Cyprus’ major skiing centre. Mount Olympus is the Highest Peak of the Troodos mountains in Cyprus, topping 1950 Meters above sea level. The best period for a skiing trip in Cyprus is from February to March. You will avoid New Year’s gatherings in hotels; in addition, it is not certain that you will enjoy a great amount of snow. On the contrary, by the end of March, due to the sunshine, the snow slowly melts. As you can see, this is not quite the Alps but where else can you enjoy skiing in the morning and sunbathing in the afternoon. With Cyprus you don’t have to limit your break to just skiing, you can enjoy it’s exceptional Golf clubs, Archaeology, Culture, Watersports, Shopping and famous nightlife.